To allow a user to login via username and password, you can go to the members page > search for their profile. Click the checkbox next their profile and click “More”. 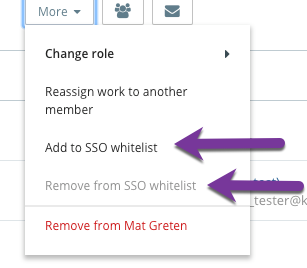 This will open a dropdown menu where your options are; Change role, reassign work to another member, Add to SSO whitelist, or Remove from SSO whitelist. Select which option would be most appropriate for the user. Once a user has been added to the SSO whitelist a key will show up to the left of their name. Note: Only Admin’s will be able to whitelist or remove users from SSO.